CoinOpCollectorForum.com • View topic - hi! new guy with a few questions! hi! new guy with a few questions! 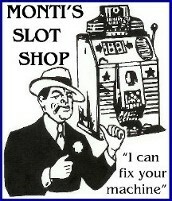 Hi "D" here Was looking for information on a new machine i bought and ran across this site. glad to see there are others like me that enjoy tinkering with things besides me. 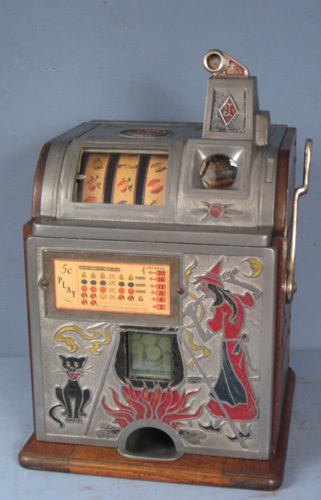 Purchased this slot machine a few weeks ago and have been trying to get it working. Was about 75 percent good when purchased and almost have it 100% mechanically. from what i've compared it to online, the mechanism seems closest to a Mills and the barrel is stamped Roto Slot. Would like to find some new paper strips for the wheels so if anyone sells them get back to me. Any information on this machine would be appreciated. I have a couple more machines to inquire about, but i'll take it one at a time lol. Re: hi! new guy with a few questions! Yes, if that is like the ones that where around Reno it should be a Mills mechanism and you should have no trouble in finding parts for it! I don't know if Mills actually made the entire unit as there was a company called Rowe who primarily made vending machines, Etc. that may have made it! Here is the only thing I came up with on it below and it was made about 1954 or later! It has also been discussed here on the Forum before by Freddy Bailey and my good friend Bill Whelan who left us over a year ago, very knowledgeable parties, both of them! Have fun with it as I believe the mechanism rotates to 6 different positions depending on who was sitting at the "Cocktail Table" and desired to play it!